An innovative conference chair, intended for communication in the office. Designed by EOOS by Keilhauer, the Filo Chair represents a new type of office chair with very comfortable seating for the conference, meeting and executive areas, as well as for workstations in the front office. Filo’s armrests plus sophisticated yet simple mechanical device provide continuous flexibility and great seating comfort. While it instantly responds to minimal movements it enhances the user’s concentration. The construction and design are distinguished by lightness and sophistication. The frame comes in polished aluminium, covered in black polyester mesh. Optional seat or backrest upholstery in fabric or leather. Armrests made of synthetic thermoplastic, black or with leather pad. The meeting chair is also available with a five-star swivel base on castors for hard and soft floors or four-star swivel base on glides. 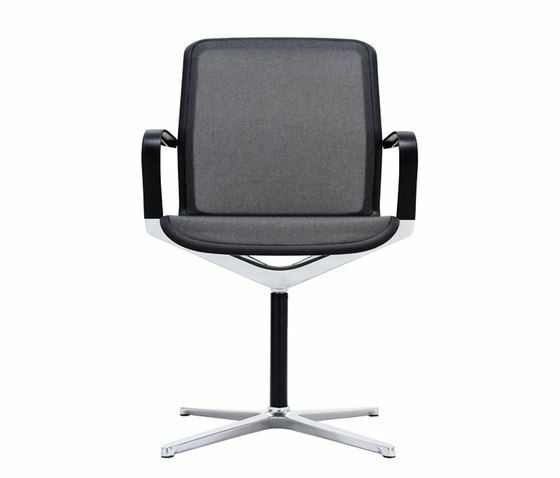 Filo is height adjustable from 47–60 cm (five-star swivel base) and has a reset mechanism (four-star swivel base). Innovative manufacturing process: die-cast aluminium, plastic injection-moulding and hydraulic press-fitting of the armrest and backrest.